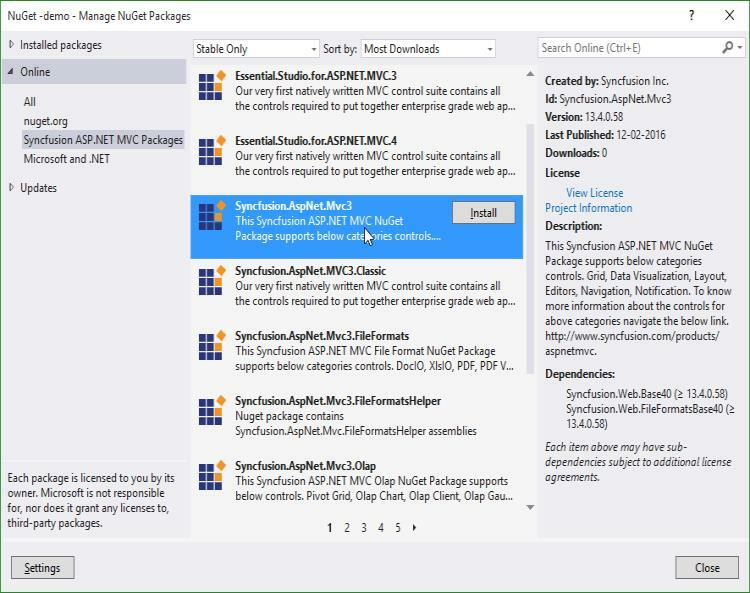 Syncfusion ASP.NET MVC NuGet packages are available here. 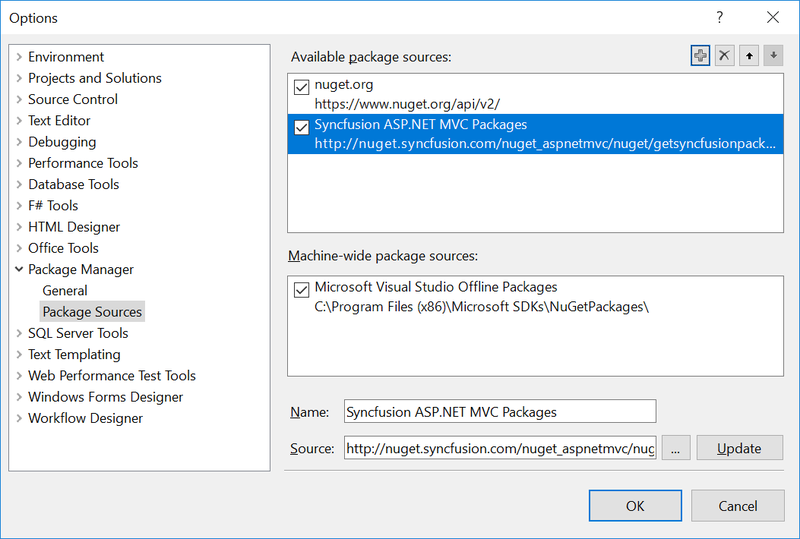 Select NuGet Package Manager | Package Sources and click Add button to add the Package Name and Package Source of Syncfusion NuGet Packages. 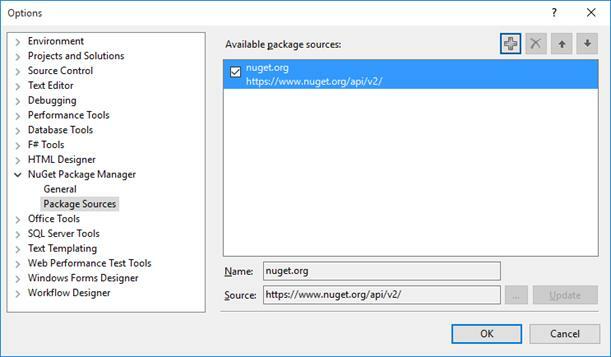 The Source text box in the above image denotes the location of the NuGet packages and the Name section, allows you to provide a unique name for NuGet Packages Source. Once configured the Package source with Syncfusion NuGet Packages, right click on project and choose Manage NuGet Packages | Online | <Package Source Name>. The NuGet Packages are listed which are available in package source location. Install the required packages to your application by clicking Install button. 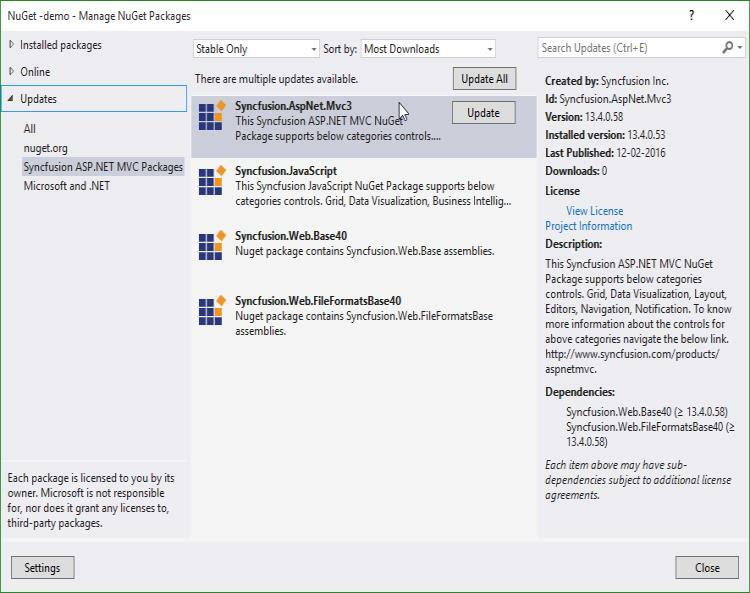 Using the Manage NuGet Packages in Visual Studio, NuGet packages can be update. Right click on Project and Navigate to the Manage NuGet Packages and click on the Updates tab to check for updates. Select the Updates -> <Syncfusion Package Source>. Refer to the following screenshot for more information. If there is a new version of NuGet you will see it in the list of available updates. Select NuGet Package in the list and click Update. When the update is complete, close and re-open all open instances of Visual Studio. By clicking Update All button, all NuGet packages are getting update. When the update is complete, close and re-open all open instances of Visual Studio.